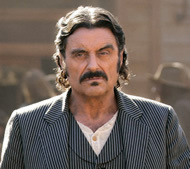 When Deadwood was cancelled last year after three seasons, HBO calmed outraged fans by announcing that the series would be concluded by a pair of movies. Unfortunately, there’s been little movement on those projects and it’s been looking less and less likely that they’ll ever happen. Now, the stars of Deadwood say our suspicions are unfortunately correct. In contrast to Deadwood’s shabby treatment, Brown recalled how other cable series have ended, saying, “Six Feet Under got the best send off episode in the history of television. Soprano’s ending was either great or awful (depending on one’s interpretation of it) but at least it got people talking. Deadwood — it just stopped. No ending. Just Stopped. It’s like never finding out that “Rosebud” was his sled or that Darth was Luke’s father. F***. The final episodes of The Wire will mark the end of HBO’s reign as TV’s best destination. Water coolers across the country will never be the same.” Stay tuned! Almost 10 years later and finally watched this series. What a tragedy to end the way it did. Should have run 5 years like The Wire. Ending Deadwood was a big mistake. I just finished watching all three seasons and it is one of the best series HBO ever created. Deadwood still has a followings and a fourth season with a true ending would be appreciated. 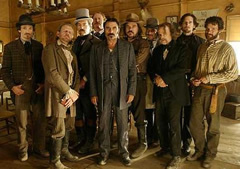 just started deadwood, about finishing season 1 and its already upsetting to know i have no end. i must say its a very interesting story line but just stopping the show is non professional.